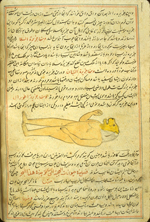 This highly illustrated Persian treatise on sexual hygiene appears to be a translation from an Indian treatise. At one point in the text it is said that Nakhshabī translated the treatise from Hindi into Persian, and at another point it states the Ziyā’ Nakhshabī transcribed the copy and illustrated it himself. 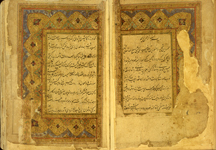 The treatise which Nakhshabī prepared was probably one of several Persian versions of a Hindi text called Kok-shastar or Kokasara and attributed to one Koka, or Koka pandit, and based on a Sanskrit text. Koka pandit wrote in Sanskrit a book entitled Ratirahasya (On the Art of Love), and it is probably this book from which the later Hindi and Persian versions derive (see Storey PL II,2, pp. 321-322). Koka is referred to as Kuka several times in this text, and the title of the Hindi (or Sanskrit) original is called Kama Sastar. The treatise is illustrated (presumably by Nakhshabī himself, according to a statement in the manuscript) by 5 full-page miniatures and 2 half-page or three-quarter-page miniatures, painted in a variety of opaque watercolors with gilt of a provincial Mughal style typical of north-west India, especially Kashmir, in the 18th century. 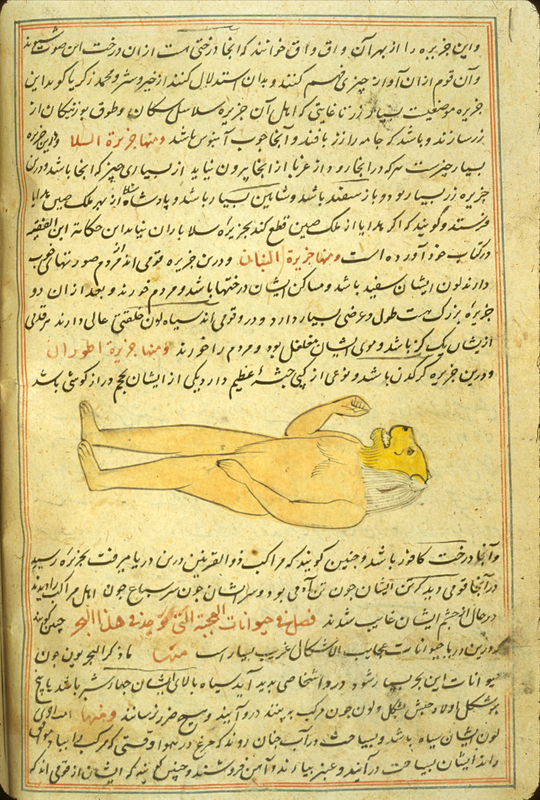 If the statement in the manuscript that Nakhshabi was both the copyist and the illustrator is correct, then this could be taken as evidence that Nakhshabi worked in India in the 18th century. The medical content is not as great in this treatise as in many of the other teatises classified as sexual hygiene, and it might more properly be placed in the category of general literature or belles lettres; this genre of literature will be discussed in another section of this catalogue. 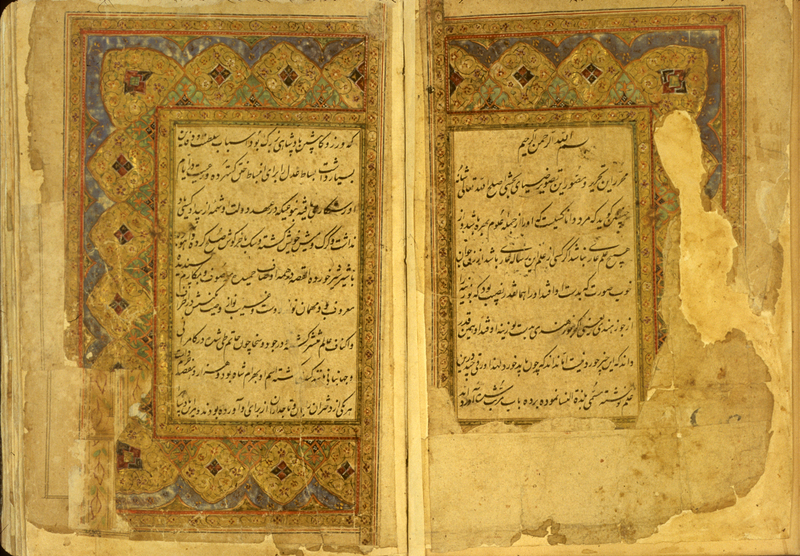 No other copies of this particular Persian version have been identified. For similar ones, see Storey PL II,2, p. 322 no. 100,e-g; and Keshavarz, "Wellcome", pp. 377-8 no. 211. The treatise has not been pubished in a modern translation or edition. The illuminated opening of copy of a Persian treatise on sexual hygiene titled Ladhdhat al-nisā’ (The Enjoyment of Women) translated from an Indian text and copied and illustrated by Nakhshabī, whose dates are uncertain. The copy is undated, probably 18th century in north-west India. A full-page painting of a turbanned and seated ruler surrounded by courtiers. From a Persian treatise on sexual hygiene titled Ladhdhat al-nisā’ (The Enjoyment of Women) translated from an Indian text and copied and illustrated by Nakhshabī, whose dates are uncertain. The copy is undated; the miniatures are typical of provincial Mughal work of north-west India, especially Kashmir, in the 18th century. A three-quarter-page painting of a court scene with a female entertainer in the lower right. 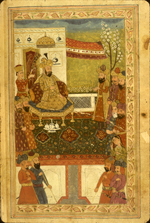 The seated and turbanned ruler can be see in the upper left. 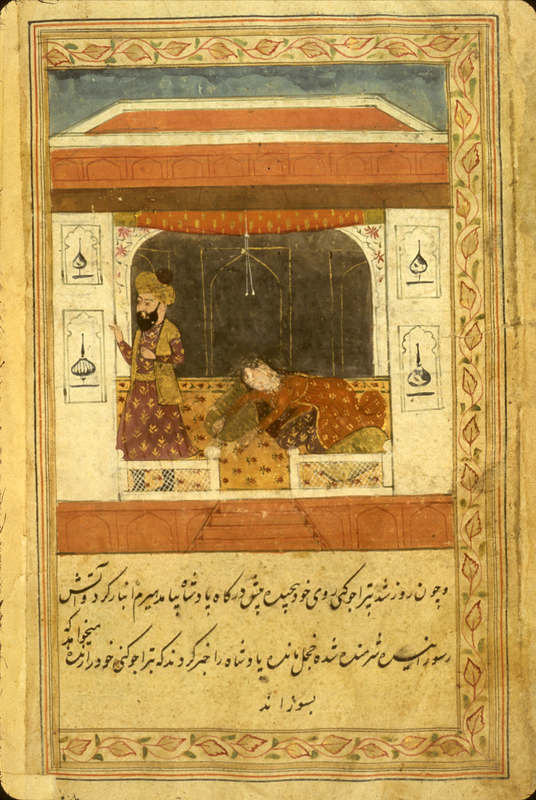 From a Persian treatise on sexual hygiene titled Ladhdhat al-nisā’ (The Enjoyment of Women) translated from an Indian text and copied and illustrated by Nakhshabī, whose dates are uncertain. The copy is undated; the miniatures are typical of provincial Mughal work of north-west India, especially Kashmir, in the 18th century. An illustration (on lower half of page) of the diagnosis of lovesickness by feeling the pulse. From a Persian treatise on sexual hygiene titled Ladhdhat al-nisā’ (The Enjoyment of Women) translated from an Indian text and copied and illustrated by Nakhshabī, whose dates are uncertain. The copy is undated; the miniatures are typical of provincial Mughal work of north-west India, especially Kashmir, in the 18th century. 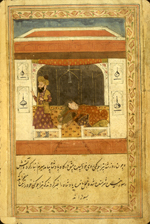 A three-quarter-page painting, in opaque watercolors and gilt, of a woman inside a house lying on the ground with arms extended, her head and shoulders on a bolster pillow while a turbaned figure, possibly a physician, walks away. 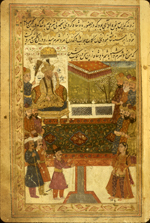 From a Persian treatise on sexual hygiene titled Ladhdhat al-nisā’ (The Enjoyment of Women) translated from an Indian text and copied and illustrated by Nakhshabī, whose dates are uncertain. The copy is undated; the miniatures are typical of provincial Mughal work of north-west India, especially Kashmir, in the 18th century. 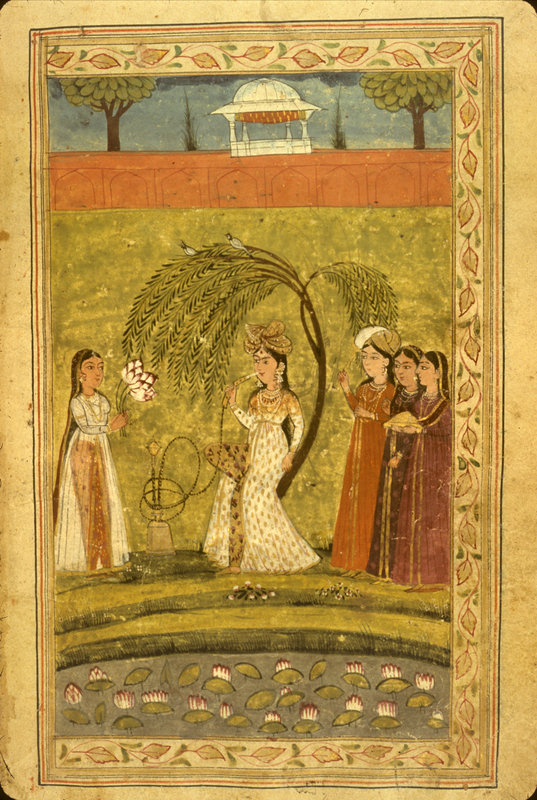 A full-page painting, in opaque watercolors and gilt, of a woman smoking a waterpipe with attendants. 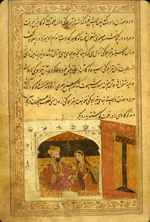 From a Persian treatise on sexual hygiene titled Ladhdhat al-nisā’ (The Enjoyment of Women) translated from an Indian text and copied and illustrated by Nakhshabī, whose dates are uncertain. The copy is undated; the miniatures are typical of provincial Mughal work of north-west India, especially Kashmir, in the 18th century. 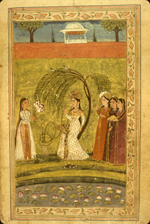 A full-page painting, in opaque watercolors and gilt, of dancing girl with musicians performing before a seated turbanned male. 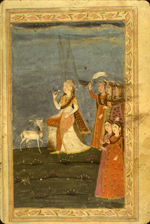 From a Persian treatise on sexual hygiene titled Ladhdhat al-nisā’ (The Enjoyment of Women) translated from an Indian text and copied and illustrated by Nakhshabī, whose dates are uncertain. The copy is undated; the miniatures are typical of provincial Mughal work of north-west India, especially Kashmir, in the 18th century. A full-page painting, in opaque watercolors and gilt (slightly defaced), of a group of women with an deer in foreground. 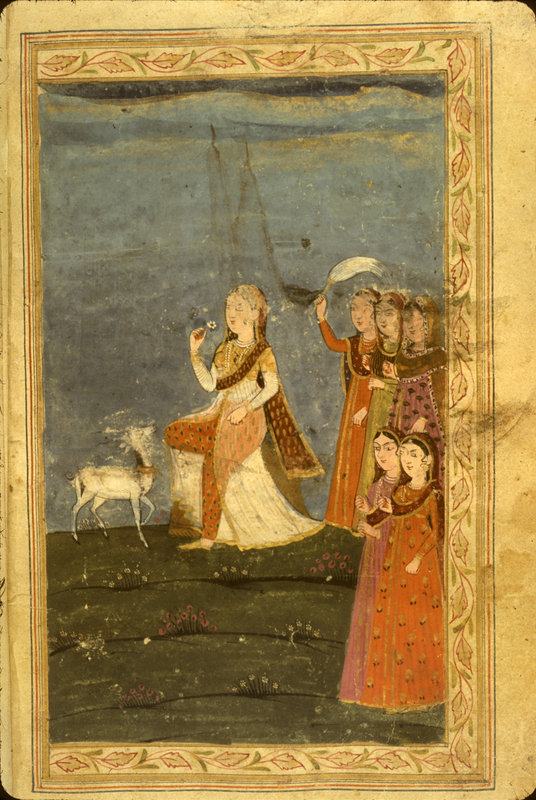 From a Persian treatise on sexual hygiene titled Ladhdhat al-nisā’ (The Enjoyment of Women) translated from an Indian text and copied and illustrated by Nakhshabī, whose dates are uncertain. The copy is undated; the miniatures are typical of provincial Mughal work of north-west India, especially Kashmir, in the 18th century. 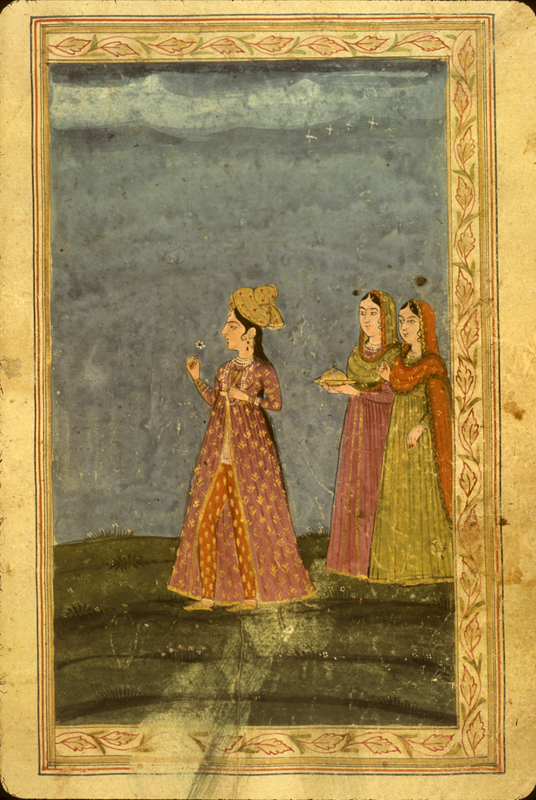 An illustration of three women, in opaque watercolors with gilt. 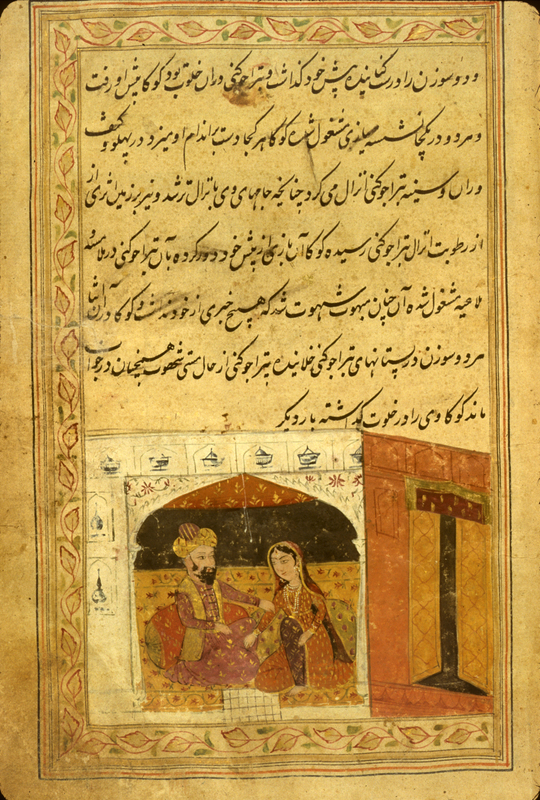 From a Persian treatise on sexual hygiene titled Ladhdhat al-nisā’ (The Enjoyment of Women) translated from an Indian text and copied and illustrated by Nakhshabī, whose dates are uncertain. The copy is undated; the miniatures are typical of provincial Mughal work of north-west India, especially Kashmir, in the 18th century. Persian. 10 leaves (fols. 1b-10b) Dimensions 21.7 x 14.5 (text area 15.1 x 8.7) cm; 8-12 lines per page. The title Ladhdhat al-nisā’ is taken from the text on fol. 1b line 8. The author's name is given as Ziyā’ Nakhshabī on fol. 1b line 2, where it says that he is "the copyist of the version and the painter of these illustrations." On fol. 6a line 4 his name is given as Nakhshabī, and it is said that he translated the work from Hindi into Persian. Koka is also referred to as Kuka several times in the text (fols. 2b and 6a) and the title of the Hindi (or Sanskrit) original is called Kama Sastar (fol. 6a line 4). The copy is undated and unsigned. The general appearance of the paper, ink, script, and illustrations suggests a date of the 18th century and a locale of north-west India, especially Kashmir. If the statement on fol. 1b is correct, then Nakhshabi was both the copyist and the illustrator. This is an incomplete copy of one of several Persian versions of a Hindi text called Kok-shastar or Kokasara attributed to one Koka and based on a Sanskrit text. Koka pandit wrote in Sanskrit a book entitled Ratirahasya (On the Art of Love), and it is probably this book from which the later Hindi and Persian versions derive. This copy begins with a long introduction giving the background of Kuka's composition (fols. 1b-6a), followed by a table of contents outlining the ten chapters; the text breaks off during the first chapter (bab) on fol. 10b. The treatise is written in a fine professional medium-small ta‘liq script, in dense black ink with headings in red. The same hand transcribed all the items in the volume. Fols. 1b and 2a have wide ornamental borders painted in blue, red, green and brown watercolors with gilt, framing the area of text; all the remaining folios have the text or illustrations framed in narrow borders of blue, red, black, and gilt lines enclosing a vine with leaves outlined in red and green. 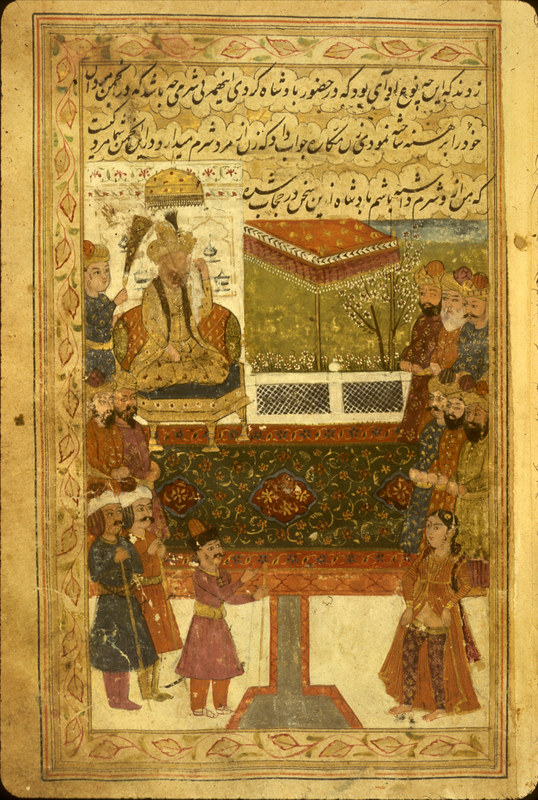 The treatise is illustrated (presumably by Nakhshabi himself) by 5 full-page miniatures, painted in a variety of opaque watercolors with gilt (fols. 3b, 4a, 7b, 8b, 9b, and 3 half-pare or three-quarter-page miniatures (fols. 5a and 5b). 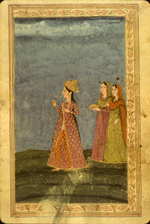 These illustrations are of a provincial Mughal style typical of north-west India, especially Kashmir, in the 18th century. The gray-brown, semi-glossy paper has horizontal, sagging laid lines but no visible chain lines . The text areas have a gold-sprinkled ground. The paper has foxing and staining, and many leaves have been repaired. The edges have been trimmed from their orignal size. Fols. 1 and 2 are damaged and repaired and guarded. The volume consists of 29 leaves. Fol. 1a is blank. Item 1 (fols. 1b-10b) is here catalogued; MS P 24, item 2 (fols. 11a-22b) consists of illustrated love poetry, anon. and untitled; and MS P 24, item 3 (fols. 23a-27b) contains recipes, anonymous and untitled. Fol. 28a has miscellaneous notes and verses in later hands written within the decorative frame; fols. 28b, 29a and 29b are blank except for the decorative frame. The volume is bound in a fine example of a 19th-century French art nouveau binding of stamped and dyed leather. It has an overall non-repetitive design of fans decorated with marine animals, birds, flowers, and Oriental human figures. There are French marbled paper endpapers and pastedowns. The volume was purchased in 1941 by the Army Medical Library from A. S. Yahuda. On folio 14a there is the impression of an oval owner's stamp which has the Arabic numeral 12 and appears to read ya' Karīm. On folio 21a there is an impression of a different oval owner's stamp, undated. Schullian/Sommer, Cat. of incun. & MSS., entry P24, p. 337.